Welcome - Joseph Smith Jr.
15 And the king [Limhi] saith That a seer is greater than a prophet. On this and other sites, we explain that Joseph Smith was only called to bring forth The Holy Book of Mormon and not to start a church. That the revelations which speak of him starting a church were changed by Joseph to say so. His purpose, according to prophecy and David Whitmer, was to convince the Christian world of The Holy Book of Mormon. Had he done so, Christians would have accepted The Holy Book of Mormon (with no strings attached, i.e. no need to join a particular church) and the reforming that started with Martin Luther would have been completed. Our approach is very simple – we detail the mandate Joseph was given in the Bible, then look at how he did to fulfill that. We discuss Twelve Doctrines that his followers adhere to and compare those with the purpose of his mandate – The Holy Book of Mormon. On your left are the Topics. They flow from the top down. Please begin at the top and work your way down. 1. Joseph was originally called to transcribe the Book of Mormon and nothing more. He had to modify this revelation to avoid condemnation for doing more than he was called to do. 2. Joseph added the word ordain. Jesus never said that to him because Jesus never called him to start a church. 4. Jesus never said anything to Joseph about starting a church. Joseph had to add that. 5. A formal church required formal ordinations. Joseph added both of which. 6. A reformation is not the same as starting a church, so Joseph had to remove the words of Jesus. Finally, the changes Joseph made are being made publicly available in the newly released Joseph Smith Papers project. 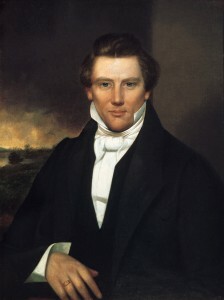 Robert J. Woodford, one of the volume’s three editors, echoed that sentiment, saying that it was up to Joseph Smith to put God’s words into the vocabulary of his day. The error, of course, is the apathy that LDS have for the changes Joseph made. The implication that Jesus misspoke, and Joseph corrected is ridiculous. Thankfully, we know when Jesus spoke, what he said, and why Joseph changed the words of Jesus Christ. Now the world knows that Joseph Smith was an unbaptized sinner – a Gentile, fulfilling Book of Mormon prophecy. The revelations he received about The Holy Book of Mormon and under the anointing of The Book of Mormon were inspired. Why Joseph made the above-mentioned changes should cause all believers to think and ponder. As we detail on this website, Joseph was not called to start a church, but to “reform” the existing churches through The Most Holy Book of Mormon.